Batista vs Triple H is one of the hotter angles heading into WrestleMania. On this week’s X-Pac 12360, Sean “X-Pac” Waltman makes the case why neither Triple H nor Batista is likely to end up playing the villain in their feud. Batista vs. Triple H: Who Is The Heel? 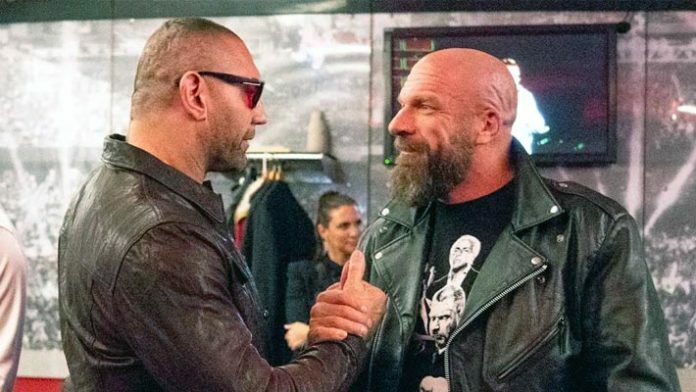 After laying out Ric Flair at his television birthday party, it would seem that the WWE creative team’s idea is for Batista to play the bad guy. Not so fast, says Waltman. “People who want to cheer Batista, there’s no reason why they can’t,” says Waltman. Waltman recalls that Batista’s last run with the company saw him brought in as a babyface, right in the middle of Daniel Bryan’s ascent. While fans were clamoring for Bryan to be positioned as the top good guy, they were instead treated to a Batista Royal Rumble win. Ultimately, there was a change of direction, and Batista ended up playing the bad guy. This go-around, Waltman says that by playing off some tension between the two that are based in reality, WWE will end up with a more realistic feud, not one where there needs to be a traditional good and bad guy. Regardless of the storytelling device being used, X-Pac says that he thinks WWE hit a home run, and he looks forward to Batista vs. Triple H.
Check out this week’s X-Pac 12360 below. This transcript has been edited for clarity. When referencing this transcript, please credit SEScoops.com. Do you agree? Does there need to be a traditional babyface/heel dynamic in Batista vs. Triple H?